After looking at the weather forecast last night today’s plan was to stay moored until after lunch and allow all the bad weather to pass over. When Jan awoke at 5.00am it was rather misty but looking like it might be a pleasant morning. Unfortunately the weather forecast proved to be correct and that glimpse of fine weather had disappeared by 7.00 to be replaced with showers. There wasn’t much of a change in the conditions after midday however we decided to move. I’d just finished doing all the pre-departure actions when a boat appeared from behind. It seemed impolite to pull out in front, and we don’t travel that fast, so I waited for the boat to pass. Little did I realize that they were going to be considerably slower than us. There was a break in the weather which revealed why we had been able to easily simultaneously record two separate TV channels last night. 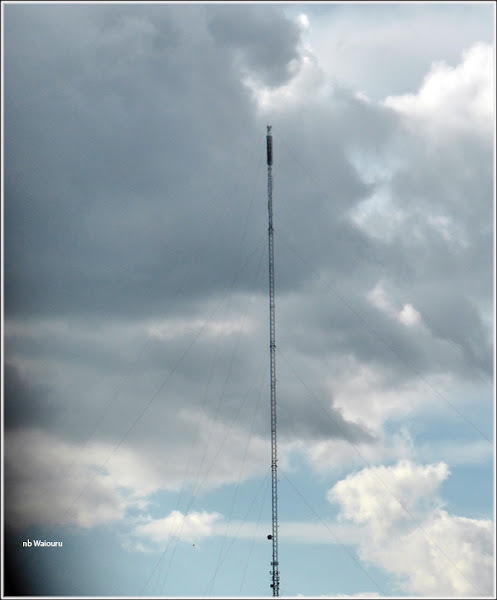 We were moored almost directly under the local transmitter! 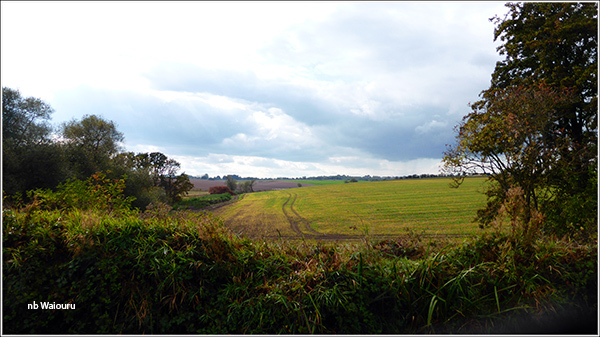 It was a very slow cruise, initially through open countryside with fields on the right and the railway on the left. 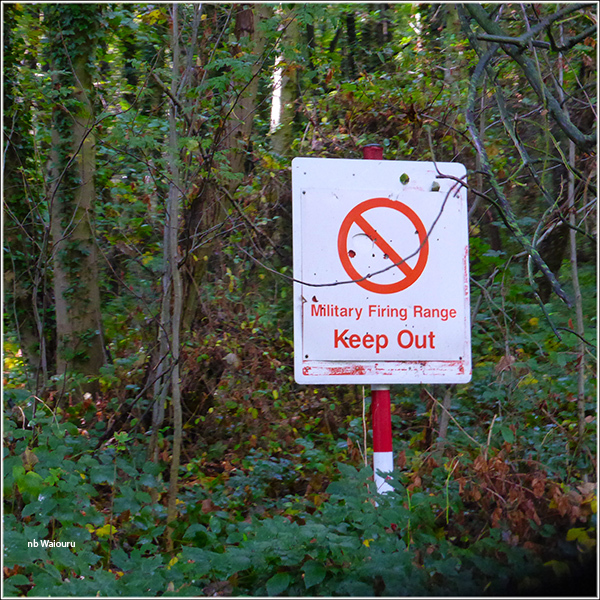 The scenery then changed to woodlands and at about the same time the showers ceased and were replaced by sunshine. Hopwas Hay Wood looked rather attractive in the autumn sunshine. But it might not be a good idea to moor on the offside. Hopwas village looks like a good location to explore, but not today. I was actually surprised by the number of boats moored either side of the village. 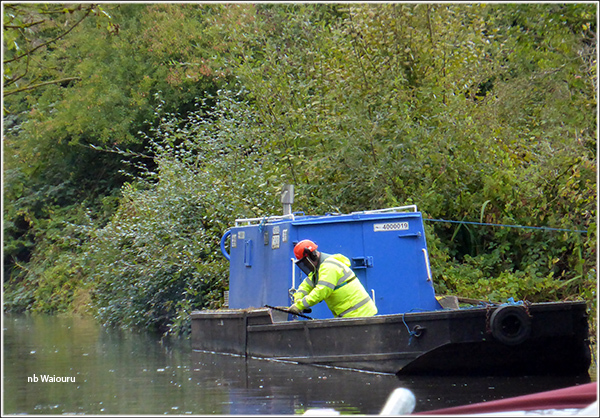 As I reached the far end of the line of moored boats a CRT work boat appeared to be cutting back vegetation on the offside. The sound of chain and pruning saws could be heard. Part of the ‘veg pledge’? Apparently I was too optimistic. 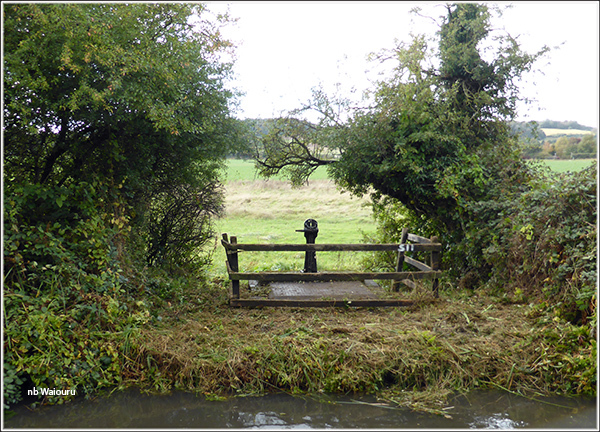 They were clearing the vegetation around the side sluice paddles. 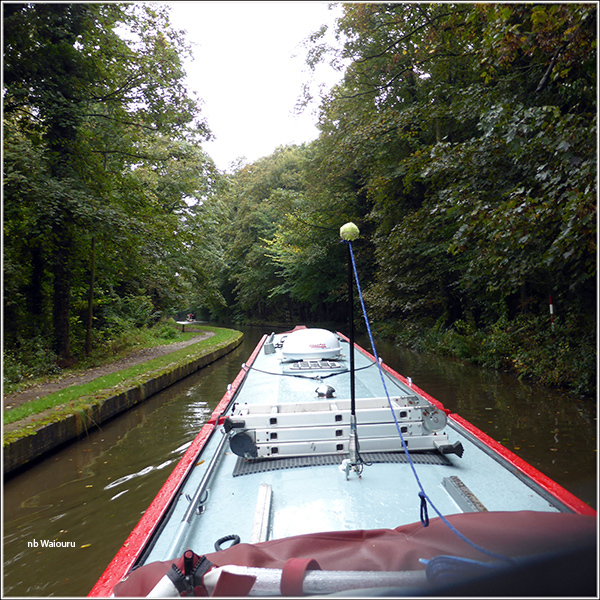 It’s probably a little frustrating for some boaters to find a line of rurally moored boats with gaps of 50-70 metres between them. I guess it provides the boater with more privacy and perhaps their running engines don’t cause an annoyance. We were already going slow so it wasn’t an issue for us today. Jan spent the time inside Waiouru doing more of that boatwork. No point in both of us braving the elements. 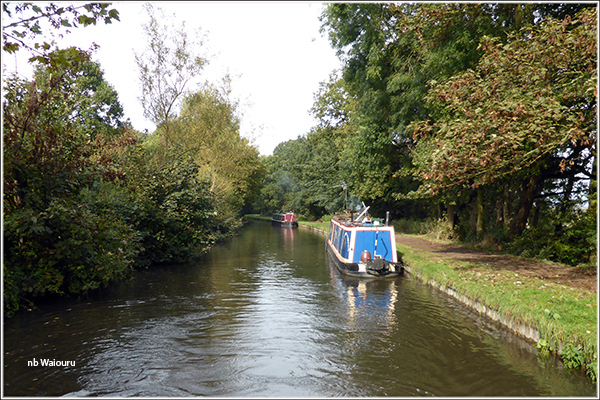 We called it a day and moored after Sutton Road Bridge where there is ready access to the nearby retail park. We don’t need much, probably only bread. We might have been able to get away with not buying bread, but Jan noticed at lunch today the last of our bread rolls had little green furry spots on them. I hadn’t noticed and had already eaten one. Obviously I won’t come down with flu this winter after my recent dose of penicillin. Jan threw her penicillin away and will likely be sorry by December!